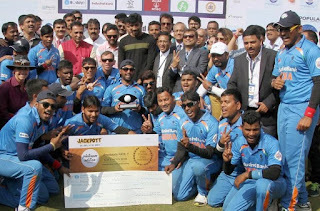 India beat Pakistan by nine wickets, winning the T20 Blind World Cup 2017 title on 12th February, Sunday for the second consecutive time at M Chinnaswamy Stadium, Bengaluru. With this win, India have retained their title, which they had won back in 2012, incidentally in Bengaluru. Pakistan had set India a target of 198 runs in the final match of the T20 Blind World Cup held in Bangalore today. Pakistan Captain Muhammad Jamil had won the toss and decided to bat first, with the team managing to score 197 runs at a loss of eight wickets in 20 overs. For India, the first wicket partnership was worth 112 in 10.2 overs. Reddy was run out for 43 off 31. However, No. 3 batsman Ketan Patel and Prakasha ensured that India eventually got over the line. In the inaugural edition of the T20 championship, which was held in the same city in 2011, India beat Pakistan by 29 runs.